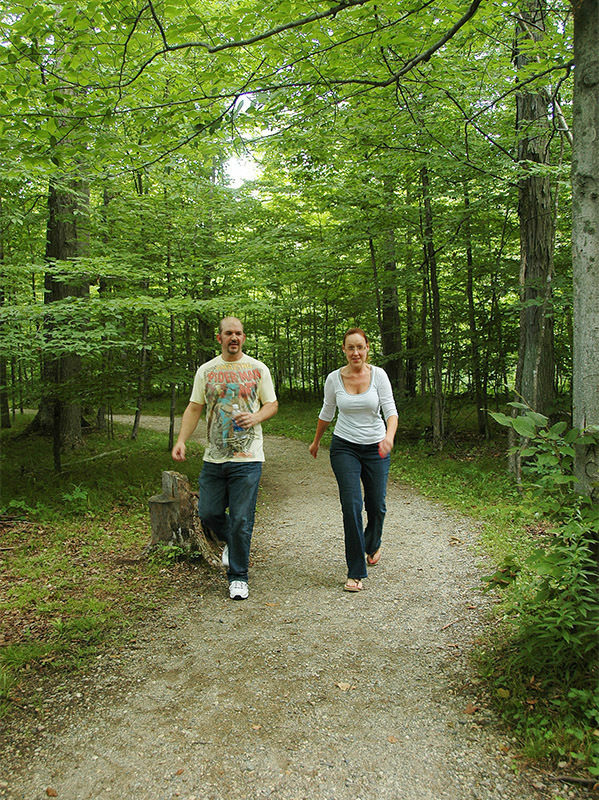 This is Indian Springs best trail for escaping into the natural world and possibly sighting wildlife. Woodland Trail is a 3.5-mile walk but three crossover spurs allow you to shorten it; Crosscut, 0.75 miles, Hunters Ridge 1.25 miles and Sawmill, 2 miles. The entire loop, however, is an easy hike that takes most people less than two hours and allows them to take a break at the parks most scenic corner, Timberland Lake. This is Indian Springs’ best trail for escaping into the natural world and possibly sighting wildlife. Woodland Trail is a 3.5-mile walk but three crossover spurs allow you to shorten it; Crosscut, 0.75 miles, Hunter’s Ridge 1.25 miles and Sawmill, 2 miles. The entire loop, however, is an easy hike that takes most people less than two hours and allows them to take a break at the park’s most scenic corner, Timberland Lake. 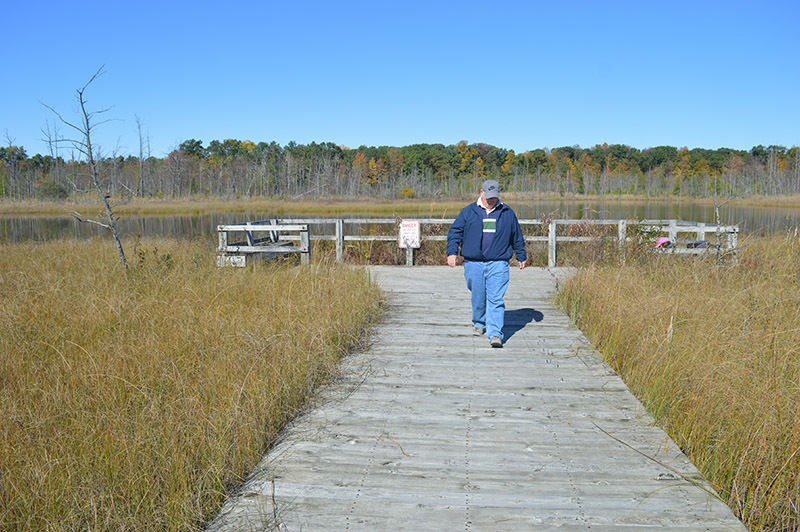 The foot trails are either surfaced with gravel or mowed lanes and have extensive boardwalks over wet areas and streams. The trail is extremely well marked and the park has also erected almost 20 interpretive plaques along the route, all of them encountered before or after the Sawmill Crosscut junctions. Being a swamp, there is little, if any, elevation gain. There is nothing the park staff can do about the bugs however. Be aware that deer flies and mosquitoes can be particularly annoying from late June through early August. Pack along some powerful repellent if you arrive then. On the other hand a late April/early May hike would be delightful here with nearly 250 flowering plants infusing the woods and wetlands with color. Wildlife that may be spotted include whitetail deer, coyotes, mink and birds ranging from barred owls and red-tailed and red-shouldered hawks to an occasional sandhill crane. The one animal the area is best known for is the massasauga rattlesnake, Michigan’s only venomous snake. This small rattler, adults range from 17 to 29 inches in length, is extremely shy and avoids contact with people at all costs. Few visitors ever see one in the park. Its color pattern consists of grey with a row of large rounded brown/black blotches down the center of the back. Although poisonous, massasauga bites have rarely cause death to people and only strike when they are mistakenly handled or stepped on, usually unknowingly. By all means don’t let this snake stop you from enjoying this trail. From the backside of the park office, a sign for the Woodland Trail encourages you to hike it in a counter clockwise direction. You immediate enter the woods, a welcome change for the open grass areas and golf course seen along the park road. At Mile 0.35 you arrive at the posted junction with Crosscut Shortcut, marked by first of four rain shelters that have been built along the loop. It’s a half mile back to the park office. Hunter’s Ridge Shortcut is reached a half mile into the hike and Sawmill Shortcut at Mile 0.8, from which the nature center is 1.2 miles away. Beyond Sawmill you hike deeper into the Huron Swamp, passing a handful of patches of water, both wooded swamps and small, semi-open marshes, that will be buggy in the summer but beautiful in the spring and fall. 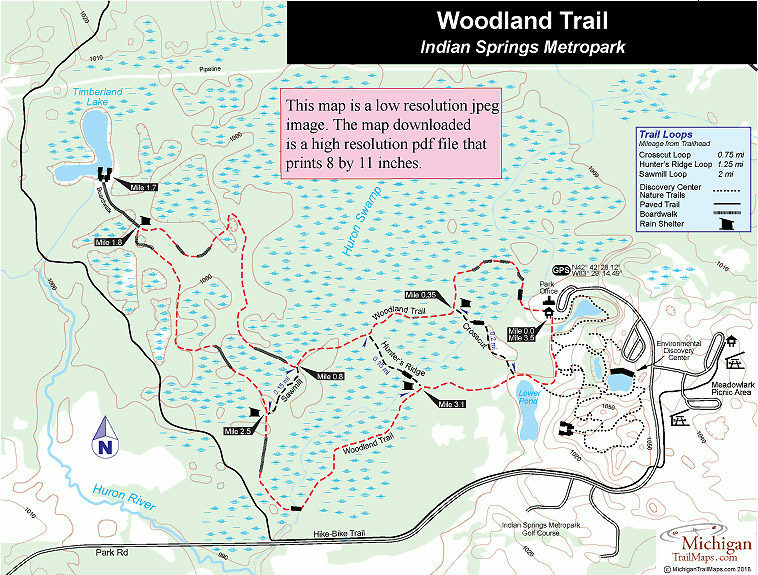 At Mile 1.6 you reach the spur labeled Timberland Lake Trail. 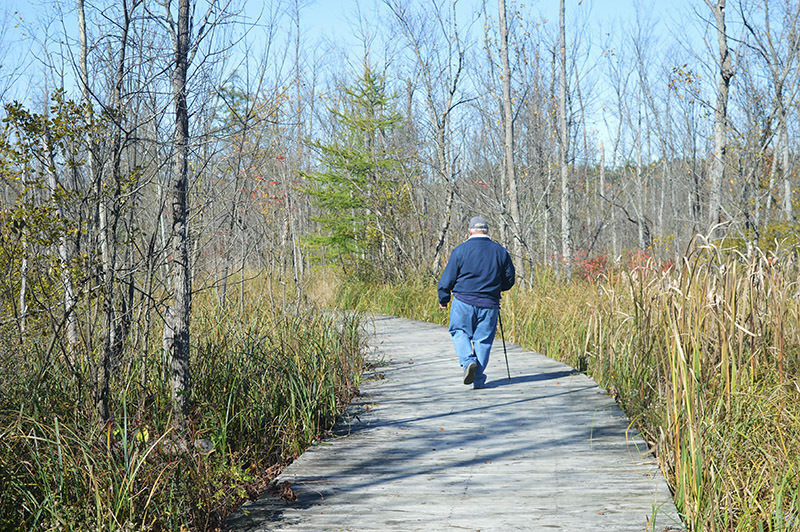 This short trail is a 200-yard long boardwalk that leads you out the woods for the first time and across a an open fen for a pleasant change of scenery. 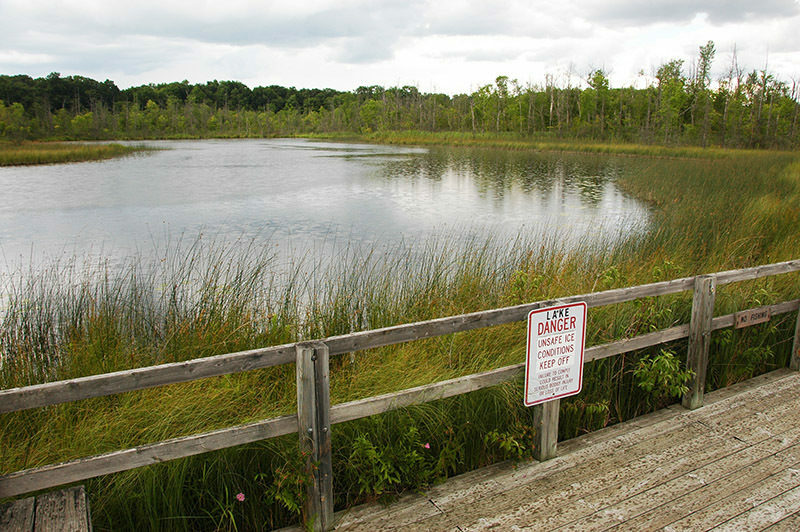 It ends at a large observation deck overlooking the secluded lake. Benches allow you to sit quiet and look for wildlife. Backtrack the boardwalk and head right at the junction for the return to the park office. You remain in the woods, passing more patches of water and a long boardwalk across a stretch of low-lying forest. Sawmill Shortcut is reached at Mile 2.5 and the interesting interpretive signs resume. You soon pass within view of the Hike-Bike Trail and then cross a foot bridge over a feeder creek to the Huron River. Beyond the bridge more open meadows and fields are encounter, making this final portion of the return not nearly as interesting as the first half. Hunter’s Ridge Shortcut is reached at Mile 3.1 and Crossover at Mile 3.3. Just beyond it you arrive at the Lower Pond where a pair of observation areas allow you to study the pond or the sedge fen bordering its east side. From the pond the trail swings to the north and the park pops into view.